People love telling stories, and we do it all the time. New technology has opened new ways of storytelling. Speech evolved into text and text evolved into hypertext, which brings with it a whole new approach to storytelling. In this new kind of interactive narrative, the author wants to challenge you to play with all of that structure – the kind of structure you can find on digital media – thanks to the capabilities of hypertext. 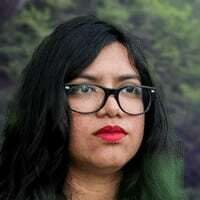 Maria de Lourdes Perez Cruz wants to rewrite old stories using new media technologies. Maria: My name is Maria de Lourdes Perez Cruz. I am a professor in the Humanities Department of Universidad Modelo here in Mérida, Mexico. Nerina: What are your main research topics? Maria: Well, I’m interested in interactive narratives. I study the relationship between hypertext as a narrative structure in every kind of digital media like video games, websites, internet videos or even apps. Nerina: What is actually a hypertext? Maria: Well, the hypertext is an informatics technology; it’s the base of the web. It changes the way we read stuff. It’s a non-sequel structure which links information with electronic hyper-wrinkles. You have all the parts of history in a big space so you can choose the one you want in the order you want. You jump between text, image, music, a piece of audio or even a photo, in the order you want. You choose the path you want as you have many options which the author can give you. You make your personal version of the story. That’s very interesting because it’s a very democratic way that we can make sense of the stories that other people share with us. Nerina: Why are you so passionate about it? Why is it important to know about hypertext, in your opinion? Maria: Because it helps you to understand how narratives work. For example, I love video games. I think that video games are new ways of more complex narratives. The interesting thing is, it’s a kind of fight between the team of the authors and you as a reader because they choose how interactive they want to make the structure, how open or how close, how much control they’re going to have, and how interactive they’re going to be. And you have the freedom to change all that you are seeing or all you are interacting with. The history of hypertext begins in 1945 after the Second World War, a bunch of academic scientists; one of them was Vannevar Bush. He wrote a paper titled “As we may think”. He imagined that maybe the work of all the academics in the world can be in one space. So the hypertext is kind of new but I think we don’t look at that with the attention it deserves because it was a little effort that created all the new ways on intermedia. The new way is so that we can have access to new ways of telling stories. Nerina: How do you think that these new ways of telling stories are changing the relationship between the author and the reader or the author and the player? Maria: I think it’s changing in a democratic way. I’d like to think that in this new kind of interactive narratives that the author wants to challenge you to play with all that structure, the kind of structure you can find on digital media, thanks to the hypertext. So it absolutely changes the way you now see the author as another player that is playing with you or is giving you some pieces of information that you can find or you can use whenever you want and change the experience because you are taking the information he gives you. At the end, all you are doing is reading in your own way and making your experience with the story, a personal version of what you want to do with that information that the author provides. Nerina: What is the most important lesson that you have learned from your research? Maria: Well, I think the most important thing is the narratives, the stories are the most human experience, and you can design them in many ways. Stories of human kind are very few, but you can make many versions of the histories or stories of the human kind, thanks to all the technological or medium development. So I think it’s the most interesting thing that you can create a new version of that story that has been told from the Greeks, for example. Nerina: Do you have a dream for the future? Maria: I don’t dream about the future, I have to confess. I don’t make plans for coming years. I live for the moment; I live each day one by one. I try to do my best, it’s like the hypertext structure – I’m living this moment and I have many possibilities. I don’t know what I’m going to choose because there are different contexts and situations. I also experience different feelings at that very moment that can make me choose something. So I don’t make plans, I’m not good at making plans. I just live day by day. Nerina: Do you have a favorite story? Maria: Well, I have many favorite stories. I love the stories of Jorge Luis Borges. I love all his stories, as well as some of the stories of Julio Cortazar. But I have to confess that my favorite story is ‘100 years of solitude’ by Garcia Marquez. That was one of the big books that my father gave me when I was a child and I really love the story of the whole family in that book. Nerina: What is the most important moment in the book for you? What kind of feeling do you remember? Maria: The interesting thing with ‘100 Years of Solitude’ is that it’s an archetypal story from all the Latin American families. So in my personal history of my family, I recognize some moments of fantasy of some characters that are from both sides of my family, from my father and my mother. I think that my favorite moment of the story is when ‘Remedios the beauty’ flies to the sky, surrounded by the blank sheets from the house. That is my favorite part of the book. Sometimes I think that I am going to do the same, I’m going to fly to the sky and disappear! Nerina: Thank you very much, Maria. Last year, we spoke to Professor Maria de Lourdes Peréz Cruz about her work on hypertext and interactive narratives, and the implications of new technologies on traditional storytelling structures. Recently we interviewed her again, to discover more about her new project on independent music in Yucatán, and how such music is allowing local communities to share their identities.